It’s Friday! And we’re feeling even more celebratory than usual because this morning I got dressed and then immediately took my jeans off. Over the last few months, I’ve been “running,” which is code for “mostly walking between weeks-long hamstring problems” and keeping an eye on calories in vs calories out. Such a rude awakening the first time I punched my daily calories into my phone and saw just how terrible those weekend margaritas actually were. I mean I knew they weren’t great… but times 3? Ouch. 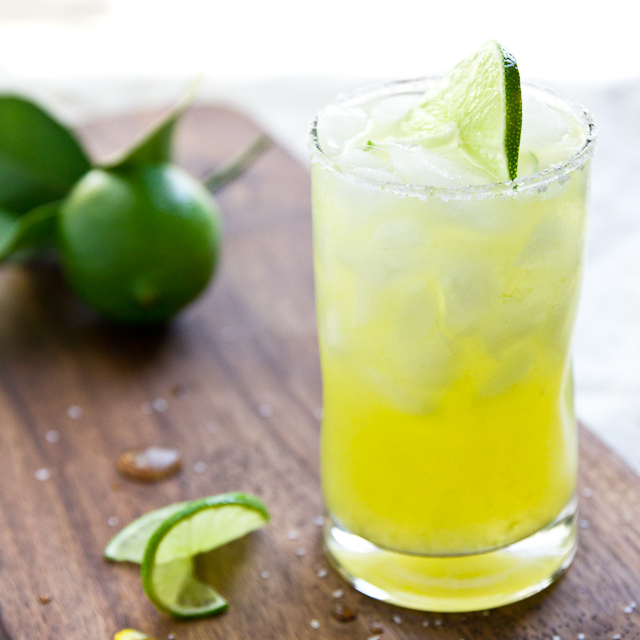 A single lime margarita was an empty calorie bomb with 300+ calories and nearly 40g of sugar. Per glass. And, um, let’s be honest here. I’m pretty sure that I’ve never stopped at just one margarita. Sure, they’re completely fresh and so much better tasting than any mix you’ll ever find but it is a lot of sugar for something that isn’t frosting. Or doesn’t have frosting on it. So we set out to make a skinny margarita by replacing the sugar in the homemade mix with liquid stevia* and the orange liqueur in the margarita with fresh orange juice. How does that stack up in numbers? But more importantly, how does it stack up in taste? The skinnier margarita is refreshing, citrusy, and really easy to drink. The orange flavor is brighter and sweetness can easily be adjusted with a couple extra drops of stevia per glass (and I find that it usually needs a couple extra drops but the standard serving amounts are listed below). And even two of them won’t break your calorie bank or undo all the good you did in the gym earlier today. It’s also a paleo diet friendly if you, like me, have a margarita-loving paleo-following friend. 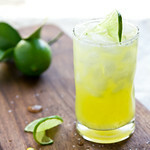 Save the calories and sugar - this margarita is fresh, homemade, lower-carb, and much skinnier than the original. And bonus! It's Paleo-friendly! 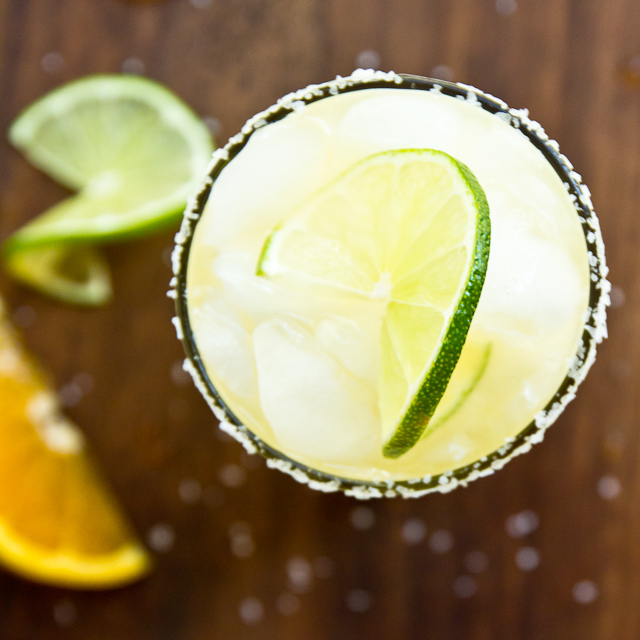 To make a pitcher of margaritas, stir all ingredients together and taste for sweetness. Add additional stevia, if desired. *Stevia, agave, and other not-real-sugar sweeteners are either the greatest thing on earth or they’ll kill you, just depends on what you’re reading. Use your preferred not-sugar-sweetener and tweak the recipe to your tastes. I LOVE margaritas, but they have so many calories. I love this alternative, and that it still tastes good is key! Congrats on not unbuttoning your jeans – that is Awesome! I’m hoping by the time someone figures out fake sweeteners will kill me, I will be too old to care 🙂 Can’t wait to try this margarita recipe. Regular ones have been killing my calorie intake. I have done a lot of research on Stevia. It is plant based and I was never able to find a doctor, nutritionist or health guru that had anything negative to say about it. Just make sure you are using real stevia, not a “mix”. You can find the liquid in any health food store! Congratulations, Shawnda! What a serious accomplishment! These margaritas looks like a great adaptation to those love you/hate you calorie bomb margs. This is just what I need tonight! And a skinny version is even better – my skinny jeans are getting to be a bit too tight these days! I have the packets of stevia, I am guessing this would work in this recipe. Great idea to slim down these cocktails. Congratulations on your accomplishment with your jean situation. You GO girl! I’m counting calories too…it really is crazy how many calories you can eat (drink) when you don’t think about it! Thanks for sharing this recipe though…I really miss my ‘ritas! just a quick question, where do you buy liquid stevia? It’s on the health/”natural” food aisle at my store, next to the supplements. I tend to avoid margaritas when out because usually they are calorie bombs that aren’t even that good! I’d totally rather have this skinnier version! This is exciting! We just finished off our last pitcher of regular margaritas and now I will make this skinny version. Congrats on the weight-loss, too. YAY!! I would like to see info that says stevia,will kill you. Is there a way to make this with fresh stavia leaves from my garden? Sure. Have you tried making homemade liquid stevia with them? That would be the most direct substitute for the recipe – just add it to taste. What kind of lime juice? fresh squeezed? bottled? what do you suggest?